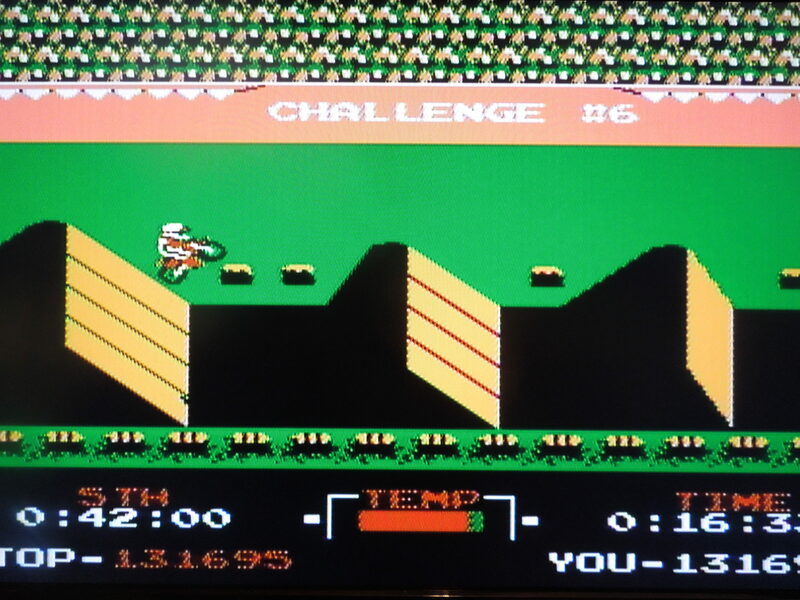 VS. Excitebike for the NES. VS. Excitebike has DIP switches on the front that allow you to change particular game settings. Note 2: If you’re interested in another obscure Excitebike game, check out my review of the Mario version, BS Excitebike, in my SNES section. Quick History: VS. Excitebike was originally released for the Nintendo VS. UniSystem arcade cabinet in 1984, 1 year before the NES version that dropped the ‘VS’ part of the title. The VS. UniSystem played arcade boards that were versions of NES games, although most of the games (like VS. Excitebike) were different from their NES counterparts. VS. Excitebike for the VS. UniSystem and the well-known Excitebike for the NES are not exactly the same game, and this review will address some of the differences. 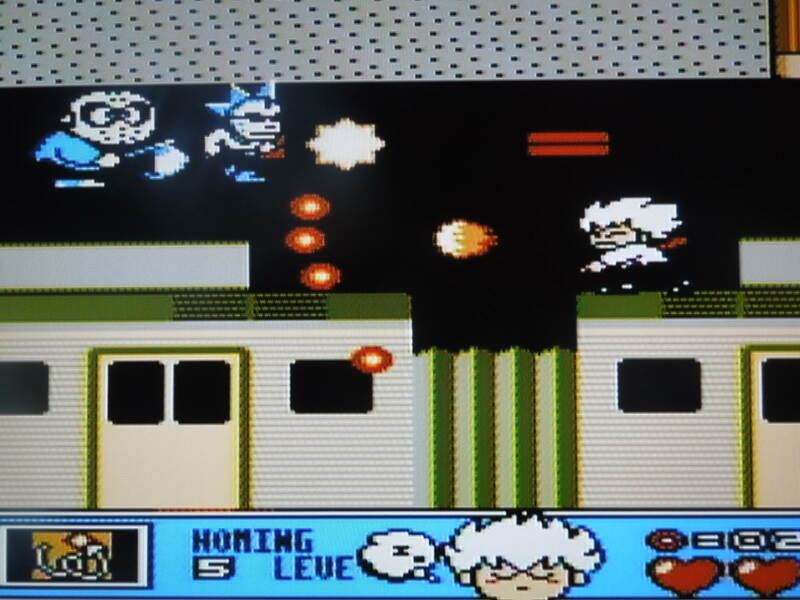 Also, there was a version of VS. Excitebike released in 1988 exclusively for the Japanese Famicom Disk System – that version is also different from the VS. UniSystem arcade version. The version reviewed here is the 1984 VS. Excitebike that was released for the VS. UniSystem arcade cabinet. 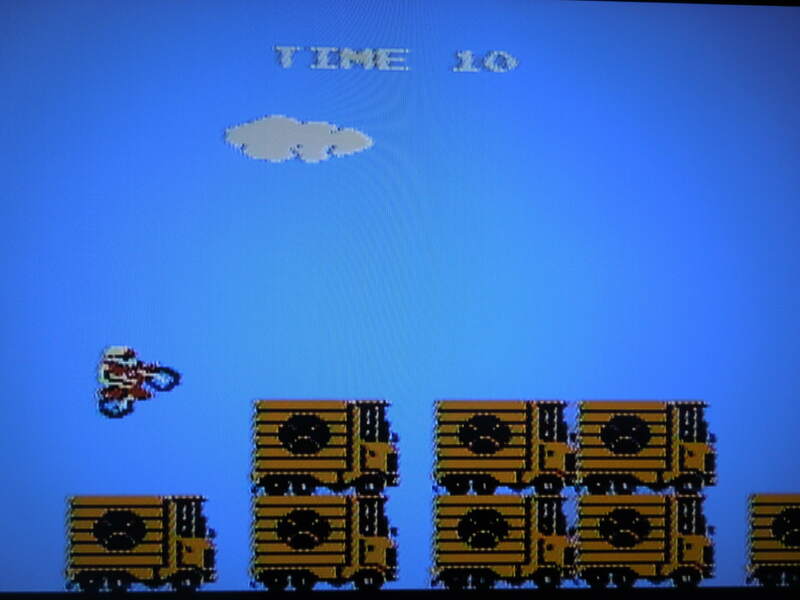 Somehow, NES reproduction makers have been able to put some of these old VS. arcade games onto NES cartridges for play on original Nintendos, and that is the case with VS. Excitebike. Gameplay: Because VS. Excitebike is an arcade game, if you let the game scroll through the ‘attract’ mode (what you would see if you walked by a particular arcade machine in an arcade back in the day), you’ll see instructions for how to play the game. Basically, VS. Excitebike is a motorbike racing game where you’ll navigate obstacles, ramps, and other drivers while trying to finish first. Pressing Start + Select on the ‘Insert Coin’ screen starts the game. A accelerates, B is turbo, but if you use turbo for too long your motorbike will overheat. You have to race through 7 tracks in VS. Excitebike – you’ll have to race each course twice, once in a ‘Challenge’ mode where you race 1 lap alone and must qualify by finishing under a designated time limit, and once in an ‘Excitebike’ mode where you race 2 laps against 3 other bikers and must qualify for the next course by, again, finishing under a designated time limit. As long as you finish in the ‘Top 5’ you’ll advance to the next course. The lower your time is (under the qualifying cutoff time), the higher your finish placement will be. As long as you finish under the qualifying cutoff time, even it’s by less than 1 second, you’ll at least finish 5th and be able to move on. You’ll have to beat the Challenge course to qualify for the Excitebike course against other bikers. DIP Switches: DIP switches are electric switches used on arcade boards (games). They allowed arcade owners to dictate the specifics of their arcade machines, like how many quarters it took to play the game, or how difficult the game should be (putting games on more difficult settings allowed arcade machines to pull in more money, because players ‘died’ faster). 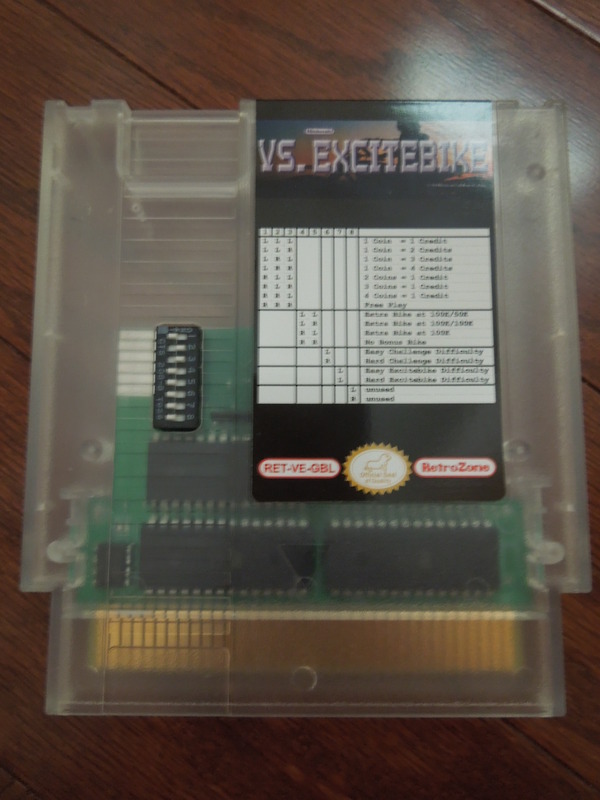 On this NES reproduction of VS. Excitebike, their are DIP switches on the front of the cartridge, along with instructions for what each switch does. For example, if you move switch 6 to the left, the game’s ‘Challenge’ races will be set to Easy (you have more time in which to qualify for the ‘Excitebike’ races). If you move switch 6 to the right, the game’s ‘Challenge’ races will be set to Difficult (you have less time in which to qualify for the ‘Excitebike’ races). 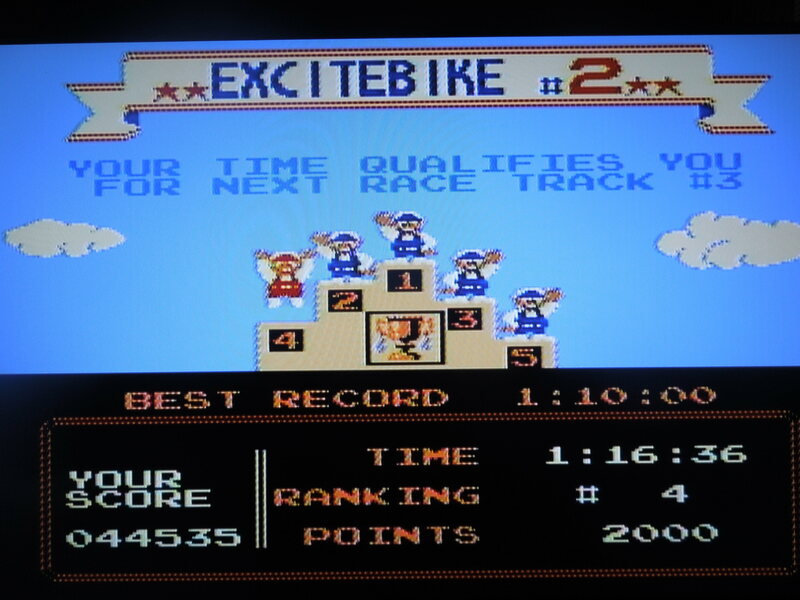 VS. Excitebike is designed to have you try and achieve a high score. A truck-jumping bonus games lets you rack up extra points. Points: VS. Excitebike is a high-score racing game. You have a ‘Total Points’ counter that runs throughout the game, and finishing 1st in either the ‘Challenge’ course or ‘Excitebike’ course nets you 10,000 points. Finishing 2nd, 3rd, 4th, or 5th nets you decreasingly lower points. If you have the DIP switches set to their defaults (all switches to the left), you’ll get an extra bike at 100,000 points, and then again at every additional 50,000 points. After you lose all your bikes/lives (you only have 1 unless you gain extra ones), it’s Game Over. 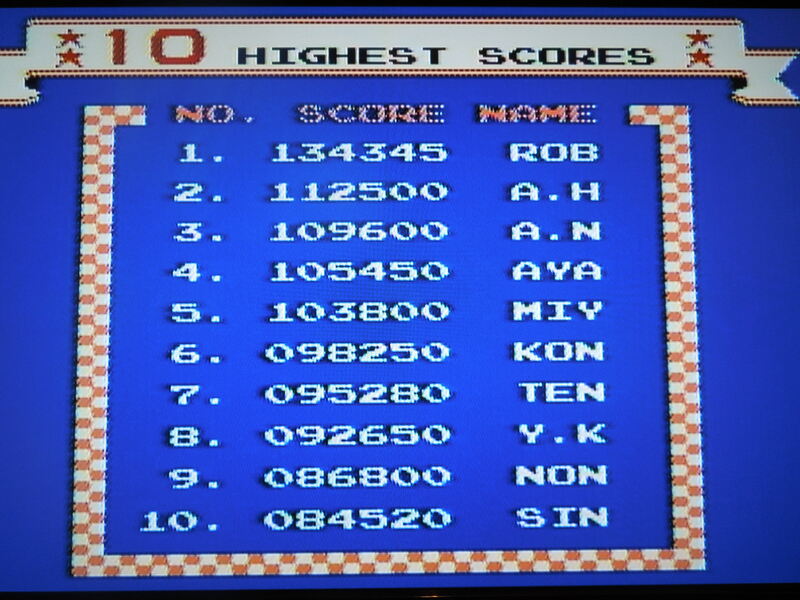 Then you’ll see the ‘Top 10’ high scores and where you ranked (you can enter your initials). Unfortunately, the cartridge does not save your high score, but keeping a notebook handy to write down your score is a good idea. Trying to best your high score gives the game great replayability. Beginner, Intermediate, Advanced: Before you begin racing, you’ll have to select among Beginner mode, Intermediate mode, and Advanced mode. These have nothing to do with the amount of time you’ll have to qualify for the next race (use the DIP switches for that). Instead, these modes simply place you at the start of different races. For example, Beginner starts you at the ‘beginning’ of the game, on Challenge 1. Intermediate skips Challenge 1 and Excitebike 1, gives you an automatic 30,000 points, and starts you at Challenge 2. Advanced skips the first 2 Challenges and Excitebike courses, and starts you at Challenge 3, this time starting your point total at 60,000 points. It’s good to start at Advanced once you grow accustomed to the game, because this lets you skip the first two courses and sets you well on your way to getting an extra bike (life) at 100,000 points. Bonus Game: A bonus game where you use ramps to jump trucks comes after Excitebike course 3. If you manage to jump all the trucks, you’ll get an even bigger score boost. This bonus game is a great way to work your way towards an extra life. The game’s 7 Excitebike races get increasingly challenging. So, where can I find this game? This one may be a bit harder to track down. I got the game from a reliable NES reproduction website, although I don’t know if it’s for sale any longer. I’m not sure how many other NES reproduction websites can make VS. Excitebike – it’s different from other NES reproductions in that it’s based on an arcade game. If you want to play the rom on your computer, I believe you’d have to play it in the MAME (arcade) emulator instead of an NES emulator. Finish in the Top 5 or it’s Game Over. Conclusion: VS. Excitebike, in gameplay, looks almost exactly like the well-known Excitebike that most gamers are familiar with. However, the gameplay is different enough that you’ll recognize this game as being different. I like that you now have to ‘qualify’ for the Excitebike courses. Also, the addition of the high score system is great, and I believe this alone gives the game more replay value than original Excitebike. 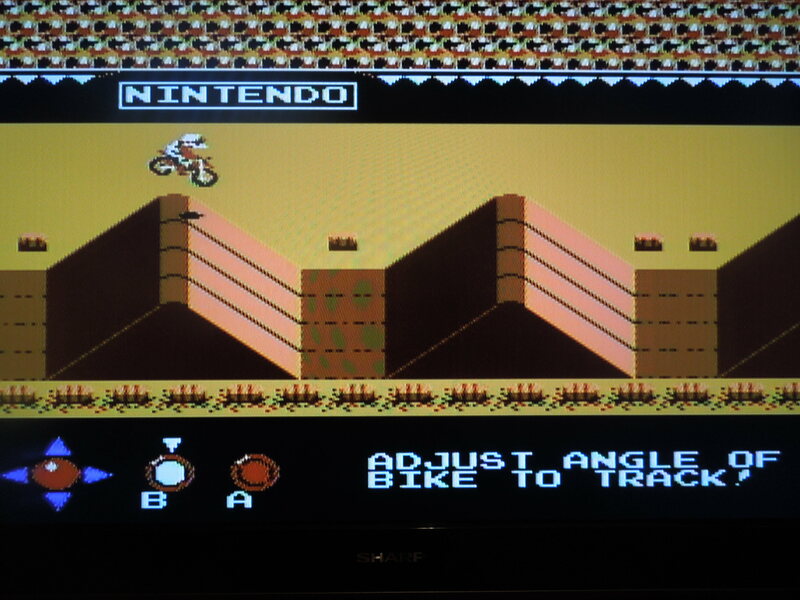 The Design mode is not in this version, and that is unfortunate, as that was one thing that gamers really loved about the original NES Excitebike. VS. Excitebike is quite challenging. Beating all 7 races, both the Challenge course and the Excitebike course, will take a lot of practice, and you’ll need every extra life you can earn through gaining points. 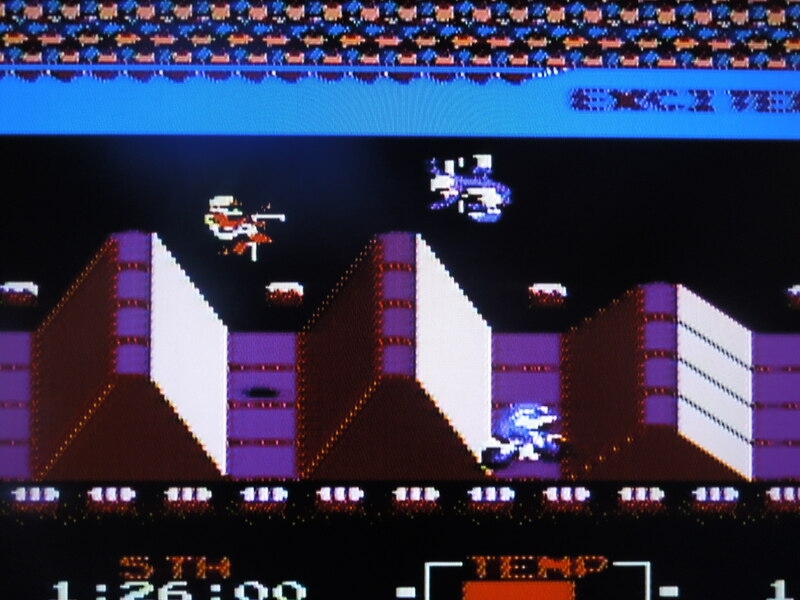 What’s particulary neat about VS. Excitebike is that it is an arcade game, and playing it on the NES is a unique experience.